This evening we had a last minute Christmas party! We have been talking about an ugly sweater party for a while, but kinda ran out of time to have it. So it was tonight or no night. 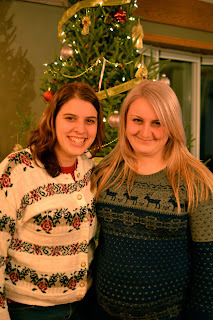 It wasn't a huge party, but it was great to hang out with friends before we all go off to our families for gatherings. Next year hopefully we can plan it more in advanced and have it at our place! EEEEEK!!! 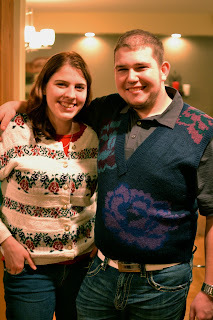 Lindsey, I think you need to find an "ugly" sweater, because I thought your's looked nice!!! Honestly.....I actually LOVE your sweater, Lindsey!! I would wear it all of the time. Feel free to pass it on when you are done with it! Haha, you ladies are funny! That's what people said at the party too! Actually I bought it new from Wal-Mart this year and I don't think it is ugly. I love it! I didn't have time to find a truely ugly one, next year hopefully! Guess I will have to go and check out Wal-Mart! !